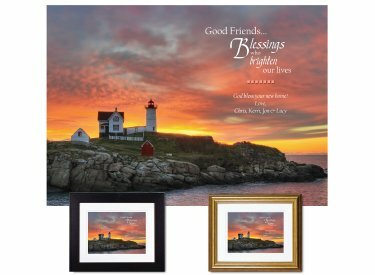 This lovely sentiment about the power of friendship is interpreted with the image of a vibrantly colored sky over iconic Nubble Light at Cape Neddick, Maine as the day begins. You'll complete the plaque by adding your own special message. Original design. Hand finished using premium museum-quality materials. Framed & Finished - Printed on premium paper with archival inks and double-matted with conservation-grade matboard as above; mounted using acid-free foam core backing; then framed using distortion-free UV acrylic glazing. A protective dust cover and wall guards are applied to the back. Your choice of black or gold wood frame (view frames here); ready to hang. Finished size: 10"x12"